Zaun becomes one of the UK’s brightest private companies. Zaun has recently been shortlisted for the finals of the Thinking Business awards, an initiative run by HSBC. The initiative has seen the leading Midlands based integrated fencing manufacturer listed among the UK’s top 54 most ambitious business thinkers as featured in the Daily Telegraph in September 2011 within a four page supplement. Co-owners Alastair Henman and Paul Painter have steered the strategic development of Zaun through this difficult financial period and deserve significant praise for their approach of continual investment in the business to secure its long-term growth. 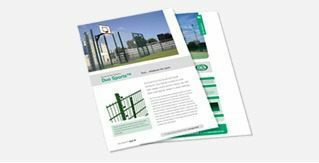 Zaun has bucked the recession coming through the financial crisis relatively unscathed thanks to a demand at home for its high security fences. The business which has invested significantly in research and development of new products which specifically target the security and export markets has seen growth across the Middle East and via its regional operation in northern France, a division which services Northern Europe. This has coincided with a £5m investment in a purpose built manufacturing facility in the West Midlands.